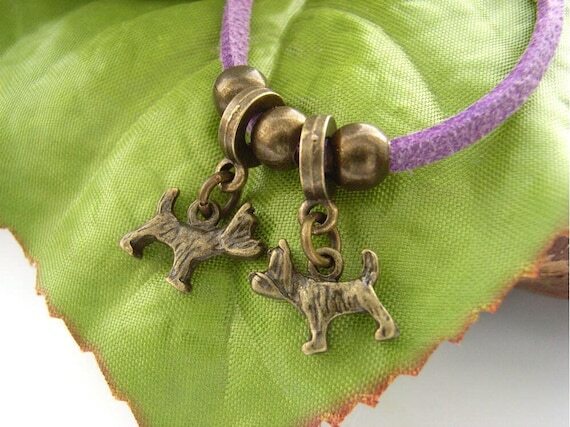 Two little dogs cord charm bracelet in a choice of lilac, red or blue faux suede cord. Really tiny little dogs. I mean, really quite tiny (10mm x 12mm). I think they are probably scottie dogs, but don't quote me on that. The charms are set on a double strand of your choice of lilac, red or blue faux suede cord and the bracelet fastens with a bronze tone lobster claw clasp. Why are there two dogs? Well, you wouldn't want them to get lonely, would you?! And they are tiny charms.